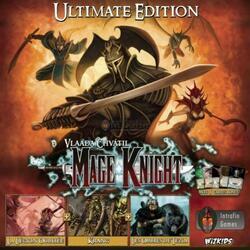 Imagined by one of the greatest playwrights, Vlaada Chvatil, Mage Knight today benefits from this Ultimate Edition gathering in a single box all the elements previously published to the delight of the fans of the first hour as new players . The Ultimate Edition not only combines role-playing and deckbuilding elements into a board game, but it also transports you to the world of Mage Knight and its three expansions: The Forgotten Legion, Krang and Tezla's Shadows . It has more consolidated rules, 5 new cards and new paintings for miniatures. This is the Ultimate Edition that all fans have been waiting for!